MONTHS ago I said that I was going to look at all the bath and cosmetic products we use and find out EXACTLY what is in them. I seriously give up. It is hella depressing. I don't know if you have ever done this sort of exercise but I recommend if you are going to do it that you get a bottle of JD ready. So instead of keeping up with this Eco-Challenge I am throwing in the towel and I am just going to slowly move our products over the environmentally friendly alternatives. I also looked at gel and hairspray for Joey but the eco-friendly products are INSANELY priced. Like 4 to 5 times the cost of the regular stuff. So I don't anticipate us changing products any time soon. I did this before the summer, and you are right - hella depressing! I managed to switch over 95% of my products, including makeup and toothpaste! It took a while to find my groove with products that works, but I am so happy I did it! My skin has never been so great! Check out my blog for all the dets! There's always the option to go no 'poo which knocks off two of the biggest contenders: Shampoo and Conditioner. Personally I'm a no-pooer/Dr. Bronner kinda gal in that if it's a particularly dirty, stinky day I'm all about the lovely lavender scent Dr. Bronner affords me. On top of that a little goes a long way in the case of my favorite doc making the $10 price tag slightly easier to bear. I started doing the baking soda/apple cider vinegar hair cleansing method back in October and it worked really great for a while, but once I became pregnant and my hormones changed, it just wasn't able to regulate what was going on with my hair. 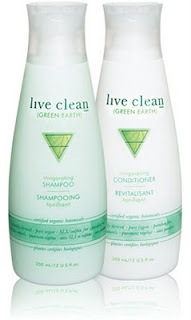 I switched to the Live Clean shampoo and conditioner in January and really like them. I read online that there's a form of formaldehyde in it, but it seems to be the best option that I've found out there beyond Bronner's or expensive mail order ones.